He has been often described as a batsman who has failed to realise his potential but Rohit Sharma is not bothered about the criticism, instead he is eagerly waiting to make his Test debut. After being catapulted to the opening slot by skipper Mahendra Singh Dhoni, Sharma did extremely well in the Champions Trophy and the tri-series in the West Indies. Ashok Menaria and Kedar Jadhav cracked half centuries to enable India 'A' inflict a 3-0 whitewash on New Zealand 'A' with a thrilling two-wicket victory in the third and final unofficial ODI match here today. Former Pakistan speedster Shoaib Akhtar says instead of running after the BCCI for normalising cricket ties, the Pakistan Cricket Board should focus on converting the national team into a world class side. The Indian government has rejected visa applications of the players of Pakistani side Faisalabad Wolves, which was to play in the Champions League Twenty20 tournament. 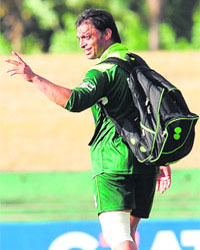 “I am not surprised that the Indians have not issued visas to the Faisalabad Wolves team for the Champions League. A livid Sports Ministry today asked SAI to recover the money spent on the athletes' airfare from the Athletics Federation of India (AFI) for the embarrassment caused to the country after 17 over-aged sportspersons were barred from the Nanjing Asian Youth Games. After a splendid performance at the inaugural Indian Badminton League (IBL), Indian shuttler Ajay Jayaram today suffered a shock defeat against lower-ranked Chinese Yuekun Chen in the opening round of the China Masters here. Sanam Singh enjoyed a good day in the office as he reached the singles quarterfinals and doubles semifinals in the $15,000 ITF men`s Futures tournament in Toronto. The diminutive Sanam, seeded second, overcame a fighting American Evan King 6-4, 7-6(0) in the singles second round. He will fight it out with Canadian Brayden Schnur for a place in the semifinals. In the doubles, he and his Indian partner Vijayant Malik defeated America`s Sekou Banggoura and Eric Quigley 6-1, 3-6, 11-9 in the quarterfinals. Up next for them are third seeds Americans Jason Jung and Evan King. Sanam Singh beat Evan King 6-4, 7-6(0). 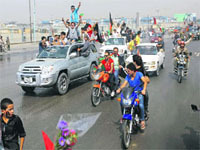 National football chief coach Wim Koevermans’ role has come in for a sharp criticsm as India lost their stronghold in the SAFF Championshp after being beaten by Afghanistan in the final. Arjun Singh Chaudhri set new records on the PGTI Feeder Tour with his victory at the Forest Hills Golf Resort today. The win, his second of the season so far, and his third on the PGTI Feeder Tour, put him in the driver’s seat with a lead of Rs 50,000 in the PGTI Feeder Tour Order of Merit. He has been often described as a batsman who has failed to realise his potential but Rohit Sharma is not bothered about the criticism, instead he is eagerly waiting to make his Test debut. After being catapulted to the opening slot by skipper Mahendra Singh Dhoni, Sharma did extremely well in the Champions Trophy and the tri-series in the West Indies. Those performances together with his good showing in the recent India A tour of South Africa have infused a new life into his career and the young batsman is now confident to do an encore when he takes guard in the five-day format. A freak injury just before the Nagpur Test in 2010 had delayed his Test debut but he is confident he will finally get to play the traditional format when the West Indies arrive for a short tour in November. “I am confident. I am expecting another Test call-up and making my debut. Although these things are not in my hand as my job is to perform and contribute towards team's victory but I am looking forward to my debut in the upcoming series,” Sharma said. In February 2010, Sharma was set to make his Test debut against South Africa but he injured himself while playing football in the warm-up on the first morning of the match. He was also part of the squad for the third Test at home against the West Indies in November 2011 and the four-Test Australia series in 2011-12 but could not make the playing XI. Since then Suresh Raina, Cheteshwar Pujara, Virat Kohli and Ravindra Jadeja have all made their Test debuts. Sharma also rejected criticism that he has not justified his immense talent. He has been often criticised for being laidback and not managing himself off the field. “I am very happy with what I have done so far,” he said categorically. “I would like to keep doing things that way. I don't look back and ponder over my failures. I am working hard on my game and keep on doing it,” Sharma, who holds the dubious record of being the first player in history to play 100 ODIs without playing a single Test match, added. 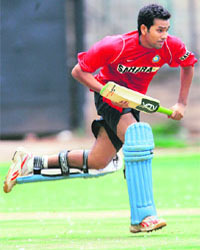 Sharma said he is enjoying the current phase of his career and hopes it continues the same way. “Shikhar and I had some good opening partnerships going in the recent past. We gave our team convincing starts. It's good as long as the team is winning,” he said. Sharma said the experience of playing in South Africa with India 'A' will definitely help his game when he tours the country again with the senior squad. “It will be an added advantage for us. Definitely, it will help us a lot. We did well and got to know about the conditions. I scored a hundred in the first 'Test'. “However, the team was not given the real feel of pitches. What we expected in South Africa in terms of wickets (pace and bounce), we did not get that. The wickets weren't that great but you have to make certain adjustment. You get used to the condition when you start playing,” he said. India completed the task with four balls to spare with Mandeep Singh playing a 27-ball unbeaten 37-run cameo towards the end. He hit three boundaries and a six during the all-important knock. Chasing a stiff 291-run target, the Indians suffered a top-order collapse before all-rounder Menaria scored a quickfire 69 off 52 balls that included two fours and eight sixes. He was involved in a brilliant 128-run fifth wicket stand off just 107 balls with Jadhav (57), which denied the Black Caps a consolation win. A late counter-attack by Mandeep then made sure that the hosts won the match comfortably. Having sealed the three-match ODI series already, India tested their bench strength today by giving a chance to spinner Jalaj Saxena and batsman Sanju Samson. Earlier, opener Anton Devcich top-scored for New Zealand A with a 85-ball 66, studded with eight boundaries, while Corey J Anderson (59) and skipper Tom Latham (53) also hit half centuries each to contribute to the team's total after India A asked them to bat. The Indians were sloppy on the field today as they dropped two catches, including that of Anderson's to allow the New Zealand post a huge total of 290 for nine. Basant Mohanty (2/39), Menaria (2/45) and Jalaj Saxena (2/60) picked up two wickets each for India A. In reply, India lost four wickets for just 79 runs on the board in 19.2 overs, despite opener Robin Uthappa scoring a fine 50-ball 46 with the help of six fours and a six. Skipper Chand, who led by example in the series, scoring 94 and 59 in the first two ODIs, failed today, getting out for just 11. Menaria walked into the middle after Uthappa and Sachin Baby (16) were dismissed in successive overs. Brief scores: New Zealand A: 290 for nine in 50 overs (Anton Devcich 66, Corey Anderson 59; Basant Mohanty 2/39). Former Pakistan speedster Shoaib Akhtar says instead of running after the BCCI for normalising cricket ties, the Pakistan Cricket Board should focus on converting the national team into a world class side. “I am not surprised that the Indians have not issued visas to the Faisalabad Wolves team for the Champions League. The fact is that until and unless we have normal and friendly relations at the government to government level why do we expect the Indian cricket board to be supportive. “I have always said that we don`t need to run after India all the time and we need to stop begging on different issues whether it is resumption of bilateral cricket ties, allowing our players for the IPL or our team for the Champions League,” Akhtar said. The outspoken fast bowler said that BCCI simply followed the policy of its government when it came to Pakistan. “We should have never expected them to issue visas for the Faisalabad team. When they first invited us we should have taken a bold stance and said `thank you`. When will we as a nation or board show some self respect and pride in our stance towards India,” he told a TV channel. “We need to concentrate on building up our cricket structure and building up a world class side. When we have a world class side everyone will not only want to play against us but on our terms as well,” he said. “There is no doubt that the standard of cricket has not only gone down in Pakistan but even worldwide. But in Pakistan we are facing problems because we haven`t had a bold captain like Imran Khan for years now and we are not facing role model players who serve as inspiration to others,” Akhtar added. He said that Indian cricket had progressed not because of the IPL but because of just one man- Mahendra Singh Dhoni. “Dhoni may not be as good looking as Imran but he has all the qualities of Imran as a captain and player and he has given their cricket a new direction and life. He has turned Indian cricket around.” He also lashed out at the ICC and member boards for not realising that there was urgent need to inject money into Test and one-day international cricket. The Ministry acted swiftly on the report submitted by the Sports Authority of India Director General Jiji Thomson, who has squarely blamed the AFI for the shocking incident. “We have told SAI that the amount must be recovered from the AFI. If they fail to return us the amount, we will not grant them any further advances in future,” Sports Secretary P K Deb told PTI. The government had spent around Rs 10 lakh for the airfare of the disqualified athletes, who returned home from China after being declared disqualified to take part in the competition. Asked whether any action has been proposed by SAI against the AFI, Deb replied in negative. “We decided not to take any action,” he informed. Thomson had submitted the report to the Sports Secretary on September 9 after he was asked by the ministry to enquire into the issue of 17 track and field athletes being disqualified from the second Youth Asian Games due to overage. “The incident came as a huge embarrassment to the country. We will recover the cost from the AFI,” said Thomson. Only athletes born between January 1997 and December 1998 were eligible to take part in the track and field events in the Youth Asian Games but the AFI included 17 athletes who were born in 1996 in the team. The world number 24 Indian, who had beaten the likes of world number 13 Wing ki Wong in Guangzhou, before defeating world no 5 Tien Minh Nguyen twice and world number 9 Jan ØJorgensen in the IBL, could not recreate the magic at the Olympic Sports Center Xincheng Gymnasium here. The Mumbai-based shuttler, who had played for champions Hyderabad Hotshots, lost 14-21 21-23 to world number 30 Chen in a 36-minute men's singles here. Jayaram could not play his natural game as Chen dominated the nets and didn't allow the Indian to come any closer in the first game. In the second game, Jayaram recovered from 0-4 down to move to a 10-7 lead at one stage. However, Chen was not ready to give up so easily and after a tough fight, it was the Chinese who had the last laugh. Jayaram will next play in the Japan Open. The other Indian in fray, Anand Pawar too went down 21-12 14-21 16-21 in the second round to Sho Sasaki of Japan in a 55 minute duel. After winning the first game, the 27-year-old suffered his third defeat to Sasaki in as many clashes to end India's campaign in the tournament. World no 37 Pawar, who got a walkover in the opening round, started off well and wrapped up the first game 21-12 against the 22nd-ranked Japanese opponent. However, Sasaki made a strong comeback in the second game and took a 8-0 lead. The seasoned Japanese maintained his lead to clinch the game and took the match to the decider. Sanam Singh enjoyed a good day in the office as he reached the singles quarterfinals and doubles semifinals in the $15,000 ITF men`s Futures tournament in Toronto. 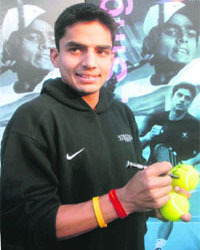 The diminutive Sanam, seeded second, overcame a fighting American Evan King 6-4, 7-6(0) in the singles second round. He will fight it out with Canadian Brayden Schnur for a place in the semifinals. In the doubles, he and his Indian partner Vijayant Malik defeated America`s Sekou Banggoura and Eric Quigley 6-1, 3-6, 11-9 in the quarterfinals. Up next for them are third seeds Americans Jason Jung and Evan King. In the Sharm El Sheikh event in Egypt, N Sriram Balaji, seeded second, moved to the singles quarterfinals after getting a walk over from Rafal Teurer of Poland. At the same event, Arjun Kadhe beat local qualifier Youssef Hossam 6-2, 6-0 to make it to the second round. He next faces eighth seed Colombian C Rodriguez. “During our time (2005) when (Syed) Nayeemuddin was the coach and (Bhaichung) Bhutia the captain, we had won the title without conceding a goal,” he said. However, it was not all plain sailing today for the 2011 PGTI Feeder Tour Order of Merit winner. The overnight leader started the day with bogeys on the second, fifth and eighth holes and conceded his advantage to Honey Baisoya at the turn. But he fought back with birdies on the 10th, 16th and 17th to maintain pressure on his opponent. A final bogey on the 18th did not endanger his victory as his opponent had hit his shot out of bounds. Arjun went on to card a one-over 71 today to win with a total of three-under 207. “My play in the front-nine was not up to the mark today but I am happy that I managed to make some crucial birdies and turn things around on the back-nine,” said Arjun. Baisoya carded a 70 for creditable second place. Local lad Akshay Sharma and Ashbeer Saini tied for third place at two-over 212, while Moniuddin Malak was a further shot back in fifth place. New Delhi: In a major embarrassment, India have dropped a whopping 10 places to 155th spot in the latest FIFA rankings issued today. This added salt to India's wounds after the loss to Afghanistan. New Delhi: Free from his dismantling duties on the cricket field right now, Indian skipper Mahendra Singh Dhoni turned his energies towards disassembling the first bike that he acquired as he enjoyed a rare break from the hectic international schedule. In a series of tweets, Dhoni shared with his over two lakh followers, photographs of the first bike that he bought -- a Yamaha Rajdoot and the how he dismantled the two-wheeler. "...I don't know who will assemble it but it was fun taking it apart," Dhoni tweeted accompanied by pictures of the bike and then its dismantled parts. Dhoni has a fetish for bikes and has over a dozen of them besides 10 high-end cars. He bought his first bike for Rs 4,500 and plans to restore it. "I think my plan of action is to restore the 1st bike tht I bought for rs4500, ...its in a very bad shape," he had tweeted last month. New Delhi: Indian boxers Aditya Maan (66kg) and Ashish (63kg) made their way into the quarterfinals of the AIBA Junior World Boxing Championships with contrasting wins in the last-16 stage of the event in Kiev, Ukraine. Maan, also a bronze medal winner at the Junior Continental Championships earlier this year, made his place in the pre-quarters beating Hungarian boxer Laszlo Kozak in what was a close contest. In the light welterweight division, Ashish, playing his very first international tournament, created a flutter in his opening round bout as he got rid of Marcel Rumpler from Austria in the second round winning by virtue of a RSC OC decision. In the pre-quarter finals, the 15-year-old from Chandigarh once again gave a good account of himself as he notched up a unanimous victory against Jegors Artjomovs of Latvia. In the quarter-finals, he will take on Shabbos Negmatulloev of Tajikistan. Mumbai: The fate of the cricketers implicated in the IPL spot-fixing scandal would be up for discussion when the BCCI’s disciplinary committee meets here on Friday to deliberate on Anti-Corruption Unit chief Ravi Sawani’s report on the scam that shamed the Twenty20 league. Sawani investigated into the charges against Rajasthan Royals players. Shimla: Sirmaur girl Anisha Akhtarali has been selected to attend U-19 camp in National Cricket Academy, Bengaluru. The right arm medium pacer has bagged 14 wickets in 17 one-day matches she has played for Women's U-19 team in the last two years. She is also in the HP T20 team.